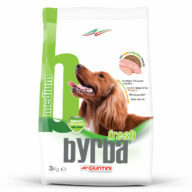 Ideal for small breeds of dog from 5 months of age, and due to its optimal energy balance this diet is suitable for dogs living either indoors or outdoors. 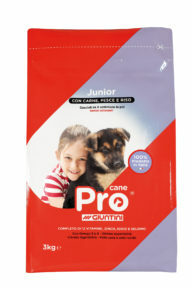 Pro Small Breed is enriched with linseed and soya bean seeds, high in Omega 3 and Omega 6 oils, which help to keep the coat shiny. The formulation also incorporates tomato extract, a source of lycopene, which has an antioxidant function and acts as an anti-free radical agent. 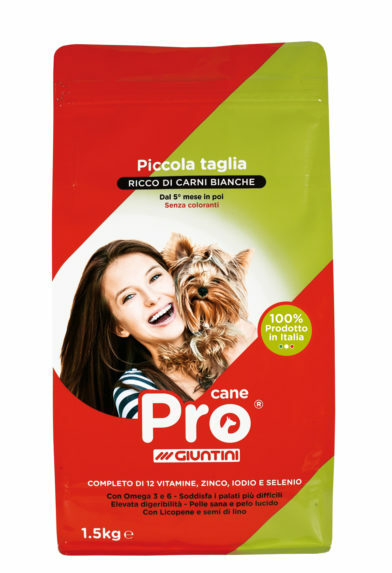 Pro Cane Small breed at will! Dehydrated animal protein (chicken and turkey min. 18%), Corn, Rice (min. 10%), Sorghum, Wheat, Soybean meal, Chicken fat, Wheat middlings, Whole soya beans, Hydrolyzed animal protein, Whole linseed (min. 1%), Dehydrated alfalfa, Sodium bicarbonate, Olive oil, Tomato Extract (min. 0,1%), Dried garlic, Rosemary oil, Oregano Oil. Crude protein: 28,0 %; Crude oils and fats: 14,0 %; Crude fibres: 2,2 %; Crude ash: 7,9 %; Calcium: 1,4 %; Phosphorus: 1,0 %; Sodium: 0,3 %; Fatty acids (Omega 3: min. 0,45% - Omega 6: min. 3,5%). Vitamin A: 18.000 I.U./kg; Vitamin D3: 1.300 I.U./kg; Vitamin E: 180 mg/kg; Vitamin C: 110 mg/kg; Vitamin B1: 6,5 mg/kg; Vitamin B2: 6,5 mg/kg; Vitamin B6: 4,5 mg/kg; Vitamin B12: 0,1 mg/kg; Vitamin H Biotine: 0,14 mg/kg; Vitamin PP: 30 mg/kg; D-Pantothenic acid: 10 mg/kg; Folic acid: 1,5 mg/kg; E1 Iron: 70mg/kg; E2 Iodine: 1,8 mg/kg; E4 Copper: 15mg/kg; E5 Manganese: 70mg/kg; E6 Zinc: 75mg/kg; E8 Selenium: 0,1 mg/kg.